Help please!! We've just had a new kitchen fitted and a quartz worktop and I'm panicking that I've made a very expensive mistake. I think the quartz is too white for the units, I much prefer the colour of the walls against the units (an off white/cream). I'm worried it looks too clinical! I usually love grey and white together but the units are actually more of a taupe grey and I'm not sure they go :-(. How do I get the two colours of white work tops/cream walls to work better together? I need to get bar stools to go under the overhang on the island, what colour/material do you think would go best? I'm too scared to pick anything else now incase I make more expensive mistakes!! Hi Lizzy! First of all, let me just say, that is one gorgeous kitchen space, love the island! I would also use some metallics and darker accessories to dull down the 'clinical' look you seem to have. I absolutely adore your kitchen personally!!! Hi Lizzy. Your kitchen looks great. The pic doesn't show much of a contrast between the top and walls tbh however I might try a pale shade of stone if you don't like it, have a look at farrow and ball skimming stone. Or if you want to try a grey have a look at strong white. I think the kitchen just needs some accessories in a variety of textures to bring it to life. Maybe try herbs/plants, wooden chopping boards, maybe something in stone/marble etc. I've copied a link for some inspiration re accessorising. I'd go for a mix of wood and metal for the stools.http://www.devolkitchens.co.uk/kitchens/shaker-kitchens/woodhouse-kitchen/ good luck, it's beautiful! I think it looks stunning and different shades of white work together, they don't clash. 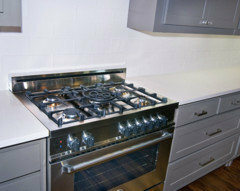 I would introduce an accent colour to warm things up a bit - are you tiling above the range cooker? 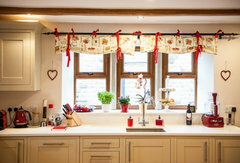 And I notice you don't have any soft furnishings at the Windows, it will feel more homely when you've added those finishing touches and it's an opportunity to add colour, pattern and texture. Then use the colour for accessories and stools. As for colours pretty much anything will go - turquoise, mustard, red, green, burnt orange, purples. What are your favourite colours? On the shelve above the range you have some decorative accessories but they don't have any colour. You could add a gorgeous vintage style clock above that beam in an accent colour. I'm envisioning yellow/mustard as an accent and also throw in some navy blue with it. I love your kitchen! As everyone else said, it's the accessories and artwork that will make the room pop, so don't worry, you've a great base to work from. If you really wanted to change the wall colour, I'd suggest a very delicate silvery purple. It would warm the space and make a lovely contrast with the taupe. 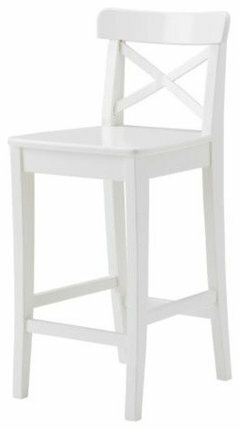 Ikea have lovely white wooden stools that would soften the look, especially if you added coloured cushions. If your lamp light is too bright - try warm White light bulbs - will add a creamy element ! Looks lovely to me too by the way !!!! 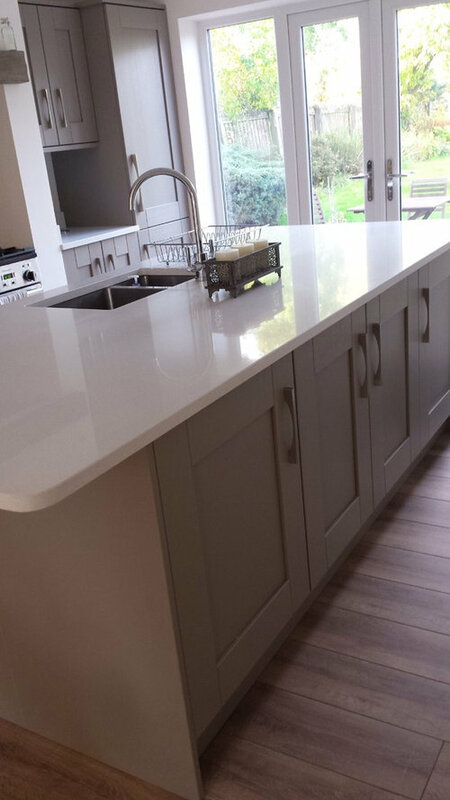 Skimming stone on the walls will warm it up and match the units whilst making the white a wow factor. Hi Lizzy, stop panicking you have a very attractive balanced pallet. and with the white worktops being a bright neutral it works perfectly, very 'post modern rural' as the comments above suggest look at dressing the room. all the best. I love your kitchen! In fact, I want the same one! I love the colours, they are muted and very harmonious. 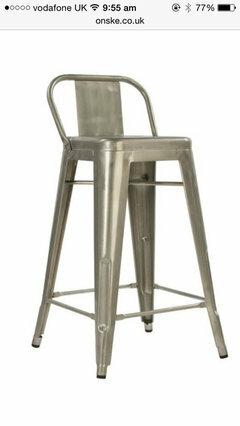 For your stools, I would try to find antique ones, wood mixed with metal... Maybe old school lab ones? or the Tolix ones would look great!! I personally like your kitchen and I don't believe there is any mistake done. There are a few images I have collected for you. In your case I would think of some nice splashback. That can help blend all together, I especially like the last image I have listed for you, where the mosaic tile splasback is a great feature. Thanks very much for your help!!! I will get shopping for accessories to tone down the difference and might pluck up the courage to discuss getting the decorator back with the hubby!!! I will be getting behind the cooker tiled so will explore some different colours to try and set the room off nicely! It looks absolutely beautiful! Use some clever lighting to soften the worktop if they look a little bright but I love the grey and white contrast! I think it looks gorgeous Just put some accessories in. Wood tones would be good & silver/chrome. Kettle, fruit bowl etc. This now is all the rage believe me - I could send you 20 customers who now have these subtle but current colours - you have made the correct choice !!! Hi Julia, it's a beautiful kitchen but I see exactly what you mean. The warmth of the wall is accentuating the cool blue tone of the worktop. The only solution is to repaint the wall in a very pale tone of the same colour used in the units. The coolness could be balanced by adding warmth in terms of materials such as wicker stools (if possible). The area behind the cooker would look fab tiled with Emery and Cie handmade Moroccan tiles - have you seen them? Best of luck. 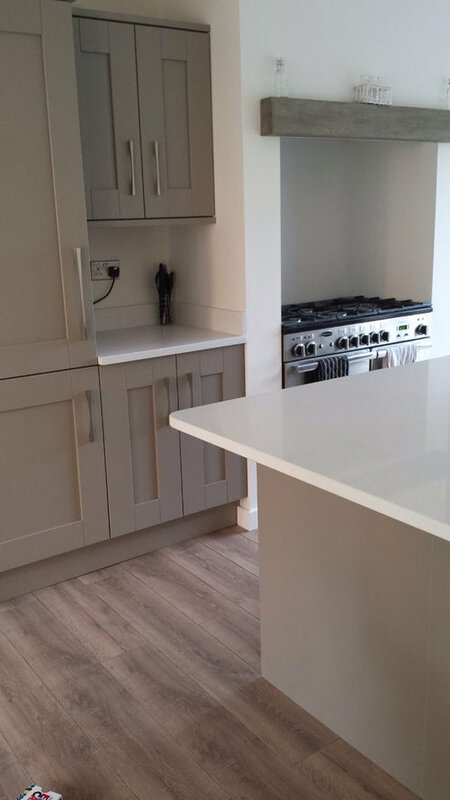 Don't worry about re-painting or making any more mistakes, gorgeous kitchen just needs a bit of soft colour. Pastels? Duck egg blue, mint green, pale pink? And a lovely vase brimful with flowers on the island. It's simply not finished or "home" that's why you are not sure whether you like it. try some soft coloured tile samples and balance them there until you decide. I think your kitchen looks lovely but sometimes it can just take a bit of time to get used to a new space. 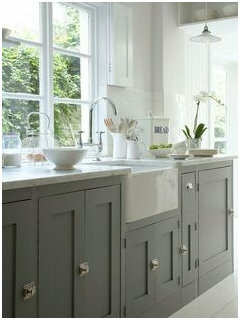 Grey and white is a really popular scheme at the moment and it can sometimes look a little cold. I liked the suggestion above regarding lighting - warm lights rather than cold will make a big difference. I'm not sure if you're planning on getting a blind but soft furnishings can help warm up the space as well as warmer coloured accessories. I notice you haven't got a splash back behind the range - perhaps you could add something a little warmer in this area to blend it all together - perhaps tiles rather than glass to add a bit more texture. Good luck! I am sure that by the time that you are finished you will be happy with the end result and start to enjoy your new kitchen. Basically everyone is correct with what they are saying, 1, you have a nice kitchen and 2, you just have to add a bit of colour to the kitchen, which will take your eye away from the two main colours. You can use a glass splashback with any RAL colour you want. Personally I don't like/recommend tiles anymore, due to grout getting dirty and looking old in time. Yes you can re-gout, but with glass you can just wipe it and it's done. If you get tired with the glass colour it's a lot easier to change than the tiles. The country style kitchens justify tiles but the modern kitchens nowadays it's all about clean lines.....less is more. You can even change colours with kettles & toasters. Or even a nice big vase of flowers on the island will draw your eye. I would agree with most of the contributors, I think the combination works well and once you add accessories and settle in using the space you will get it how you want it. You have to live with and in the space for a while and it is amazing how your tastes change and develop. One practical suggestion maybe add a focal point on the wall behind the oven/range, a painted glass splash back or tiles? Maybe a splash of colour, introduce a new bold colour which you can then link your accessories with. You have done a great job, enjoy your kitchen. The kitchen looks great but you are obviously not happy with it. You can't really do a great deal other than accessorize, without major expense. I would go for quite a vibrant wood for the stools like Zebrano and look for a matching large chopping board and knife block. You will need something behind and to the sides of the range cooker or you will be forever wiping the painted surface and due to the close proximity to the walls it may get scorch marks from the gas burners. 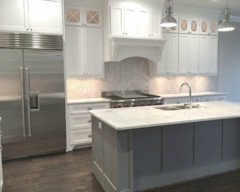 I am currently doing a lot of design work in California and the subway type tiles are very popular at the moment. You could do this in the range area and then paint the back wall of the alcoves either side of the cooker a couple of shades lighter than the tiles. A large artwork piece would look good on the left above the bin. Hope this helps. Re-paint your walls with Brilliant white- completely neutral, won't fight with your quartz and will also allow the colour of your cabinets to sing. 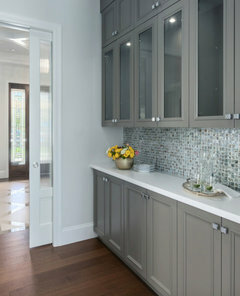 It might be worth painting your splash backs a few shades lighter or darker than the cabinets to add some extra depth to the space (see image) and to combat what you perceive as being overly clinical. It's difficult from your photos to assess how strong the cabinet colour is. 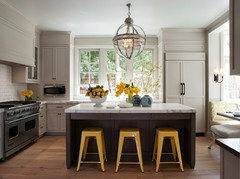 Re: the stools, natural timber to tie in with the flooring or otherwise something bold like signal red or orange. The white quartz is fabulous, very practical, very fresh. Get over it. The kitchen is nice, the work surface is very White but nothing to worry about. I think the floor is the main issue. It's too dark for that door choice, it's making the worktop and wall colour stand out more.. A lighter shade large format tile or LVT, would change the whole look of the space. This would allow the Quartz and wall colour to blend in. 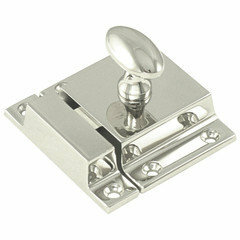 Do you have any lighting under wall units, this would help. A warm white LED system could be installed with ease, using a touch free dimmer to adjust light. I've noticed the range cooker is a tight fit with no handle space (recommendation is 150mm each side). This is space for reaching pots on back burners, when using front, also somewhere for handle to go without getting hot (if you think about it, the only place they can go is over another burner) , the kitchen designer should have known this. The main concern is no splash. This is a must! The wall at back and sides will be ruined if not addressed. Where is the kitchen from? What brand is the Quartz Samsung, Silestone or Compaq? Hi Lizzy, your kitchen is perfect. Hi Lizzie. Firstly I think your kitchen looks great. Perhaps it feels clinical to you as it doesn't have many accessories. The kitchen below is a slightly lighter green/grey with white corian. They had a contrasting blue island with wooden worktop. totally agree with all the comments. your kitchen is lovely, it just looks a little bare as you've not moved in and lived in it yet. Add some plants, add some accessories, get some warmth into the room. you could add some glass to the walls - particularly in the recess of your range cooker. I love the stone mantel. your room is gorgeous. I don't agree with the comments on your floor, it looks to me like it tones with the mantel. 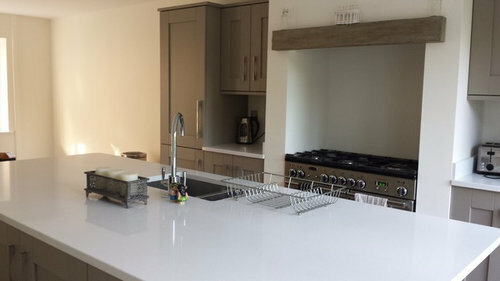 kitchens always look bare until they've been accessorised - this room has been brought to life by our clients use of accessories. Hey Lizzy, just wondered what you did in the end. It looked great - you should share your final photos! Floor tones with the mantle? Personally, I think the doors tone with mantle? I moved into a newbuild house and had no say in the kitchen. 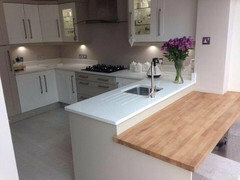 The cupboards are a taupe colour very similar to yours and the worktops are cream. I have often thought I'd have preferred it if they had installed a white worktop instead of cream! I think your kitchen is perfect. Wow what a beautiful kitchen! just crying out for a vase of colourful freshly cut flowers in front of the sink. Oh and a fantastic pendant light! check out our website www.lightingcompany.co.uk for some vibrant Rio inspired Carnival colours or some more subdued Industrial trends. I think it's perfect t the way it is. It looks fabulous. I would not change a thing. Very very tasteful. Help urgent colour advice needed- kitchen not working!